Following Sir James Greenley’s sudden retirement, the position of C is vacant. Despite all their run-ins, Burnside isn’t averse to Peele taking over, reckoning that the devil you know is always better than the devil you don’t. He maintains that although Peele would be a minor disaster as C, someone they didn’t know would be a major one. And when Burnside learns that John Tower Gibbs (Dennis Burgess) is the front runner, Peele becomes more and more attractive. Gibbs and Burnside have a long and painful history and if he did become C there’s nothing to suggest that future relations would be any more cordial. So Burnside assigns both Sandbaggers with a new mission – Operation Kingmaker. Its objective is to find compromising material on Gibbs whilst at the same time promoting Peele as a worthwhile candidate. With no world shattering events to deal with in Operation Kingmaker, office politics are the order of the day. It has a lighter tone than most of the previous episodes, especially when depicting the relationship between Peele and Burnside. To begin with, Peele is at his most genial – as he’s attempting to use Burnside and Wellingham’s close relationship to his advantage (hoping that Burnside will be able to persuade Wellingham that he’s a serious candidate for the job). Burnside though is already ahead of him, as he’s already pushed Peele’s credentials to a slightly incredulous Wellingham. Wellingham has no particular liking for Peele and correctly surmises that Burnside is simply keen to ensure that anybody but Gibbs gets the job. This isn’t the only change afoot though, as Burnside’s secretary, Elizabeth, hands in her resignation. She’s leaving to get married and Burnside is characteristically far from delighted at the news. He fails to congratulate her and when he realises she won’t reconsider, insists that she appoints a replacement before she leaves. A further example of his monumental lack of tact is when he mentions he doesn’t want anybody young – someone about her age would be fine! Sue Holderness had been acting since the early 1970’s, although she was still a few years away from her career-defining role as Marlene in Only Fools and Horses. She only has a limited amount of time in this episode, but her brief appearance suggests that she’ll make a decent foil to Burnside. The tone is set after he discovers she doesn’t have a regular boyfriend and he asks what’s wrong with her. She counters that he’s considerably older than her and isn’t married, which is a decent retort. He offers her the job and as the door closes behind her, we see something quite rare – a smile from Burnside. Another character making her exit is Jana Shelden as Karen Milner. She appears to have been positioned as a potential romantic interest for Burnside, though in the end this didn’t amount to anything mainly because the scars of Berlin seemed to be too fresh in his mind. A pity she didn’t return, as she also made a good working partner for Willie (as seen in Decision by Committee) although regular team-ups between the SIS and the CIA would have probably stretched credibility a little. Neither Willie or Mike appear to be delighted with Operation Kingmaker. Willie doesn’t have any moral qualms about sabotaging Gibbs’ chances, he’s more concerned about what would happen to Burnside if it was discovered. But Mike does seem a little apprehensive about what he’s been asked to do, although this may just be Michael Cashman’s acting choice as it helps to make his contribution stand out (given his fairly small role in the story). Finding dirt on Gibbs is difficult though. Willie asks D. Int. 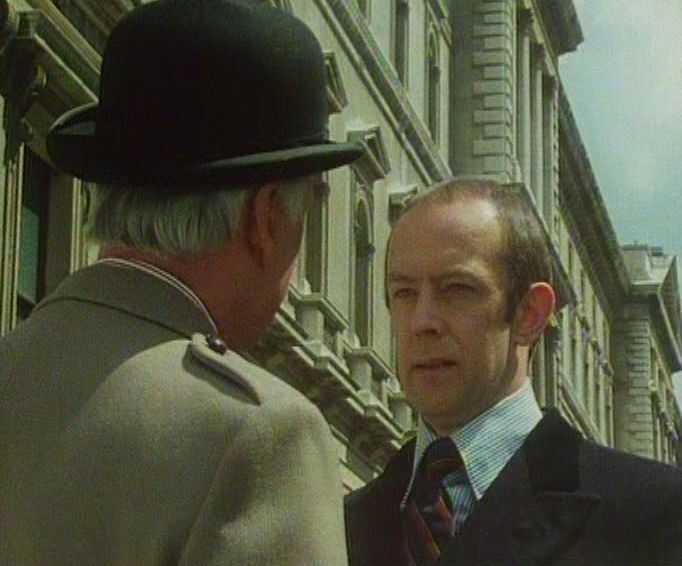 if he knows anything and he tells him that Gibbs has “the brain of a computer, the stamina of an ox and a bite that’s considerably worse than his bark.” They do finally uncover something promising and Burnside casually mentions it to Wellingham. But it later becomes clear that Wellingham knew about Gibbs’ indiscretion anyway and this decades-old scandal doean’t prevent him from being appointed as the new C.
Whilst Operation Kingmaker lacks the dramatic punch of the series one closer, it sets us up nicely for the conflicts that would play out during the third (and as it turned out) final series. No third series reviews? I was interested in what you thought about the three not written by Mackintosh. It’s on my to-do list along with a few other series that I haven’t touched in a while (Public Eye, Survivors, etc). Keep an eye on the blog, I’ll get round to it eventually!